Even though Illinois, the county of Cook, and the city of Chicago are all in horrible financial shape, the dollar value of clout hasn't appeared to devalue in the least. Our elected officials and city principals like to talk about reform and transparency, but they also like to enjoy the benefits of unchecked power. Chicago specializes in such things. For example, one of Mayor Emanuel's appointees to the Chicago Public School Board runs an investment fund for companies that specialize in privatizing school services and operations. Turns out that appointee had an ownership stake in five companies that would go on to triple their business with CPS since she became a member of the school board. Of course, CPS contracts of $25,000 or more require central office approval. Conveniently, many of the contracts between her companies and CPS were for the amount of $24,999. Mayor Emanuel once made a big deal about his executive order which banned campaign contributions to him from city contractors.Then, he used a "direct voucher payment" loophole which allows companies to procure Chicago cash without bids or contracts, to move nearly $40 million in municipal money to donors of his. That's what clout is all about. You'd think our new billionaire governer Bruce Rauner has enough money to avoid the unseemly and corrupt use of clout. Guess not. Rauner allegedly set up a strawhouse residence in Chicago to allow one of his children to be eligible to apply to exclusive Chicago magnet school Walter Payton Prep. When his child didn't get into the school, Emanuel's good friend Rauner then reportedly called up then CPS chief Arne Duncan and asked for help. Rauner denies asking for help but records show otherwise. Rauner's child was subsequently admitted to Walter Payton Prep through an alternate route, Duncan is now the nation's education secretary, and we just elected Rauner as governor, largely on an education reform platform. Speaking of federal, state, and city clout mixing, let's not forget President Obama's highly sought after future presidential library. Four universities are finalists to receive the president's future library. The University of Chicago, the University of Hawaii in Honolulu, New York City's Columbia University, and the University of Illinois at Chicago have all put in bids to the president's library foundation. The U of C, where first lady Michelle Obama worked for years, where the sitting president once served as a faculty member for the university's law school, and where their friend and advisor David Axlerod currently serves as a staff member as the head of the university's institute of politics, recently sweetened their bid by pressuring the city to give up South side park land. The price the university would pay for acres of park land? A whopping $1. For the uninitiated, $1 is the amount often used when Chicago believes giving up its land to a private company will benefit the city in intangible but amazing ways, and also when they want to symbolically slap residents in the face particularly hard. Clout costs Illinois residents. Some experts estimate that corruption in the state, in all its forms, costs us upwards of $500 million. They call it the "corruption tax." Seems apt. You'd think we'd get tired of it all, but Illinois just doesn't seem to learn. In fact, one of the state's finest universities was recently revealed to have taken part in what appears to be clear clout profiteering. Remember the Dingles? Leon and Karin Dingle were convicted in federal court late last year of pocketing millions of grant dollars that were supposed to go to fighting AIDS, cancer, and other ailments in minority communities. A new report from the Chicago Sun Times reveals that the Dingles "collected nearly $700,000 in rent over seven years from the [University of Illinois at Chicago]," for space in a small, one-story building they owned a few miles from the state university on the West side of Chicago. That $700,000 in collected rent was more than twice the $310,000 they paid for the entire building, according to UIC and property records. The Dingles' Advance Health, Social and Educational Associates, INC. rented space in the 9,000-square-foot building at 2234 W. Walnut from the summer of 2006 until the lease expired in the fall of 2013, according to the report. The couple was indicted on federal grant-fraud charges about a year prior to the lease ending, on Oct. 4, 2012. UIC says they used the space for storage of equipment. The Sun Times reports that though UIC would not comment on how the university heard of the space was available. However, when UIC signed the lease, Leon Dingle was treasurer for the Illinois Medical District Commission, "a government agency that oversees development within a 560-acre swath of the West Side that includes the UIC hospital campus." UIC spokesman Bill Burton also would not comment on whether there was ever an appraisal done to determine if the rent paid with state funds was appropriate, or whether Dingle's position as a medical district commissioner had an impact on the decision by the university to rent the space. It all appears very convenient. Well, not to tax-payers. Remember those lucky CPS contracts to companies owned by the Emanuel-appointed school board member? They tripled their business with CPS, largely on contracts that came suspiciously just under the amount which would have required greater scrutiny. Well, UIC and its friends the Dingles similarly skirted a competitive bidding process which could have provided better stewardship of the financially beleaguered university's budget. The university requires bids for leases that cost more than $100,000 a year. UIC ended up leasing 5,549 square feet from the Dingles', paying as much as $96,404 a year in rent. 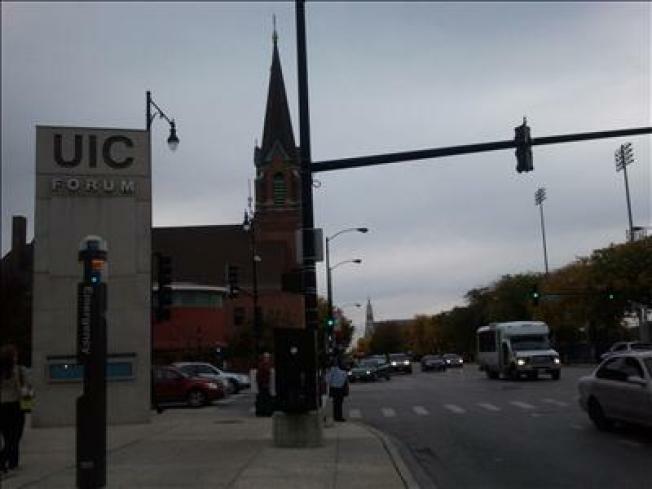 In all, UIC paid the Dingles just under $700,000 to rent a portion of their building and a parking lot. UIC, a fine teaching and research university, has struggled through money problems for years. The reasons for that are far-reaching and complex, though doing business with their money in a wasteful way with friends of the university couldn't have helped. However, that's the way business is done in Illinois. At least UIC's Obama presidential library bid proposal wouldn't grab ownership of park land from the city the way U of C's does. That is noble, or maybe just decent, but it also makes it unlikely that UIC will "win" the library.